The high school graduation rate for the DeKalb County School District (DCSD) has improved significantly, based on recently released data from the Georgia Department of Education. The four-year graduation rate for DCSD’s Class of 2017 was 74 percent, a four-point increase from the 2016 graduation rate of 70 percent. Between 2013 and 2017, the District graduation rate improved 14 percentage points. 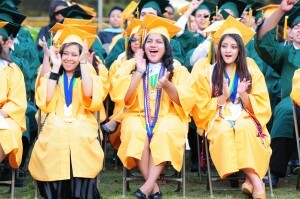 DCSD’s work toward closing the gap between district and state graduation rates continues to persist. Each high school has individualized support programs for students. Post-secondary transition specialists are housed in eight of the lower-performing high schools to add an extra layer of support for students. These staff monitor students identified as at-risk to help them remain on schedule and in school. Some of the services include attendance monitoring, online academic credit support, post-secondary option exposure and mentoring. Students begin assessment to determine post-secondary options in the 8th, 10th and 11th grades. They are given information regarding PSAT, ACT, ASVAB, and Industry Certification exams.